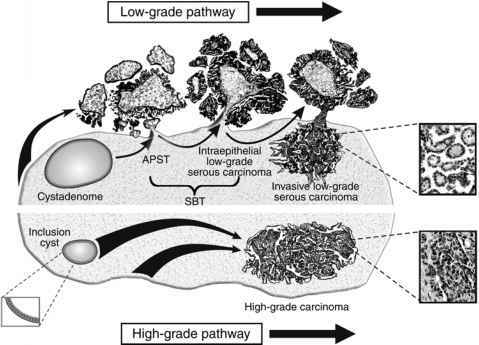 Unlike BRCA-associated breast cancer, which has a poorer prognosis with lower levels of estrogen receptor expression, lower levels of histological differentiation, higher frequency of lymph node metastases, and shorter disease-free survival (96,127), BRCA-associated ovarian cancer seems to have a more favorable prognosis. Rubin et al. (81) examined 53 patients with germline mutations in BRCA1 in comparison with sporadic age- and stage-matched controls. The investigators noted a significantly improved median survival for advanced stage patients with BRCA1 mutations to be 77 months compared with only 29 months for patients with sporadic cancers (p < 0.001). Boyd et al. (95) noted similar findings in their report of 88 Jewish ovarian cancer patients with either BRCA1 or BRCA2 mutations. Compared with controls, mutation carriers were noted to have longer median time to recurrence (7 months vs 14 months, p < 0.001) and increased survival (p = 0.004). After adjustment for age and disease residual, BRCA mutation status was noted to be an independent prognostic factor among patients with stage III tumors, associated with a reduction in relative risk of death of 25% in comparison with sporadic cancers.